Powell City Council on Thursday approved an annexation request submitted by The Ohio State University for a 30-acre parcel located near the intersection of Sawmill Parkway and Home Road. Pictured is a rendering of the medical center OSU plans to build on the site in the coming years. Representatives from The Ohio State University were on hand for Thursday’s Powell City Council meeting to seek annexation of several parcels that make up a 30-acre piece of land located near the northeast corner of Sawmill Parkway and Home Road, across from Olentangy Liberty High School. The land, which the university is purchasing from Golf Village LLC, will be used to construct a medical campus, beginning with a 200,000-square-foot ambulatory care center. Council members voted to suspend the rule requiring three readings and then voted unanimously to approve the annexation of the land into the city from Liberty Township. The Powell Planning and Zoning Commission will review a sketch plan of the first phase at its July 11 meeting. Lutz said there is a “misnomer” that land annexed from Liberty Township no longer benefits the township. He said annexing the land into Powell would not reduce taxes in any way for Liberty Township, citing the 8 percent of property taxes paid by Powell residents that go to the township. Lutz added phase one is projected to employ at least 500 physicians and staff, with an estimated payroll that will exceed $50 million annually once the facility is fully complete. He said those numbers will only increase with additions of later phases. 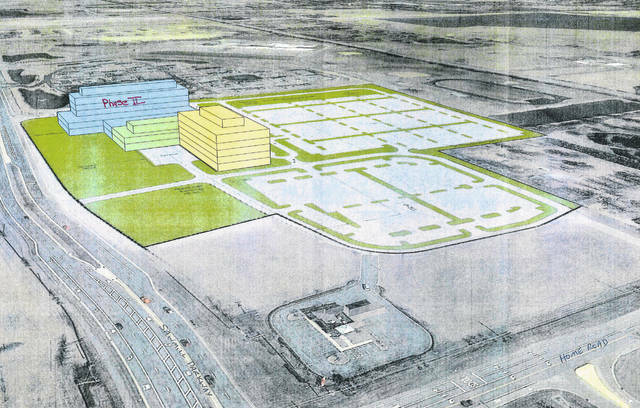 The Ohio State University Wexner Medical Center is also looking at building a similar facility on the northeast side of Columbus, near New Albany. The cost to construct each campus is estimated at $95 million. Keith Myers, vice president of planning and real estate for OSU, said between design and construction, it would be at least two-and-a-half years after final approval before doors in Powell would be opened. Lutz praised the stable longevity the medical center will bring, as well as the known commodity it represents.